New edition of this very rare deep spiritual jazz album first released as a private-press album in 1969 on flautist Lloyd McNeill’s own Asha Record label in Washington, DC. First reissued on Soul Jazz Records’ Universal Sound sub-label in 2011 (long deleted) and now available newly digitally remastered on Soul Jazz Records main label in a limited edition of 1000 copies worldwide. Lloyd McNeill is an African-American flautist, painter, poet, and photographer born in Washington, D.C., in 1935. His multi-disciplinary creative life led to encounters and friendships with Nina Simone, Picasso, Eric Dolphy, Nana Vasconceles and other legendary cultural figures. McNeill grew up through the era of the Civil Rights Movement in the 1960s and his life and work is a reflection of those ideals. 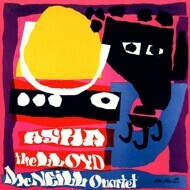 ‘Asha’ was the debut album by the Lloyd McNeill Quartet released on his own private-press record label, echoing the Civil Rights and African-American themes of the era - black economic empowerment and self-sufficiency – as well as a beautiful spirituality to the music. In the mid-1960s he moved to France where he became friends with Picasso, working with a number of émigré-jazz musicians whilst living in Paris. In the late 1960s he taught jazz and painting workshops at the New Thing Art and Architecture Center in Washington. In the 1970s he travelled throughout Brazil and West Africa studying music and taught music anthropology in the US.